Dan Lyons’ new book “Lab Rats: How Silicon Valley Made Work Miserable for the Rest of Us” makes it pretty clear how awful the new trend toward open plan offices is. Originally, people believed open office plans would be a significant improvement to the previous (and horrible) approach to office design – the dreaded cubicle. Which is ironic, given that the originator of the cubicle hated what his creation had become. According to Lyons’ well-researched book, open office plans – which coupled ill-conceived new age concepts with poor implementation – were designed to improve productivity. They not only did the opposite, but they destroyed job satisfaction, lowered moral and increased suicides in the firms that deployed them. One of the most interesting stories in the book revealed how a very influential team within Apple – after being brought in to see the innovative new “flying saucer” headquarters – threatened to leave if they were forced to work there. This team had enough influence to be transferred back to one of the more traditional office-based floorplans, which significantly improved both their productivity and reduced the odds that they would leave Apple for greener pastures. One of the most common complaints with these open plan offices – that are somewhat designed to look like huge living rooms – is the excessive noise that defines working in them. Eliminating this problem was the primary design focus for the new Microsoft Surface Headphones. I’ve been using them heavily in recent weeks (and liked ‘em so much I already bought a few as gifts as a result). What’s fascinating is, over time, rather than getting used to the noise and being able to filter it out, a significant number of workers find it increasingly annoying. This adversely impacts their job satisfaction, productivity and morale – increasing illness, employee depression and workforce churn. This trend suggested the need for a solution that addressed the noise problem. But while traditional noise-cancelling headsets could be used as a solution, the existing products in that category were designed around music and movies. And since they were meant to be used largely on planes and public transportation, they don’t address the needs of the office worker. Employees need to connect to multiple devices (phones, PCs, etc.). They need to be able to switch between noise cancellation and sound enhancement (so they can hear a co-worker talking to them). And many want to listen to music while working, but need to be able to instantly switch to an incoming call as needed, without having to manually interact with the device or find and execute a command on an app. Finally, the solution needs to be attractive but not be too flashy, it needs a full day’s battery life, must be robustly built, and have intuitive controls. 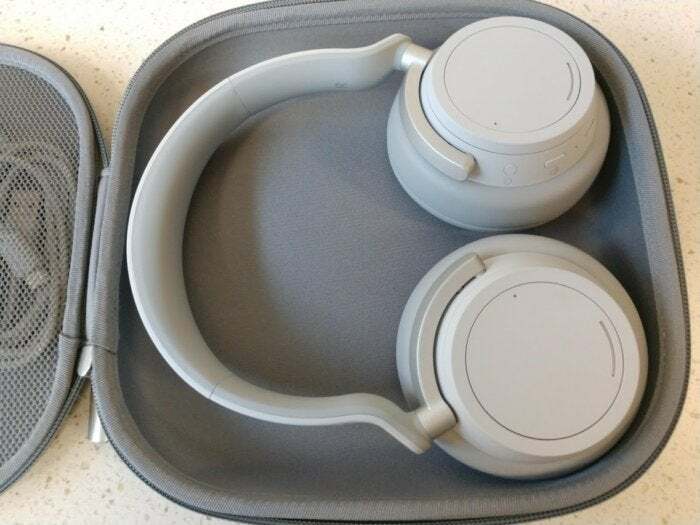 The Microsoft Surface Headphones are an over-the-ear design rather than on-the-ear or in-the-ear. This allows for better sound isolation, and generally makes the headphones more comfortable to wear for hours. But it also makes them larger, less portable and often less comfortable (compared to in-the-ear designs) to sleep in. One of the interesting features of the Surface Headphones is a sound isolation dial that allows you to crank up the level of active noise cancellation or switch to amplify the sound around you. While this last isn’t as good as the set of military-grade headphones I bought when I used to compete in combat tournaments, it works surprisingly well in the office when you need to hear an announcement or someone that wondered over to chat with you. Using them to talk to someone over the phone works well, too, and they have a dedicated microphone mute button common for headsets designed for phone use. I initially took issue that they don’t conform to the Surface design aesthetic, and they certainly aren’t as spectacular to look at as some of the metal framed alternatives. But now I think the muted appearance is better in an office environment because it makes them look more industrial. Plus, the soft plastic finish should resist scratching and be less likely to mar other things that are placed with the headphones. Using them on a long plane trip provided I could sleep with them on in a pinch, but they have a touch control to stop and start media. This suggests you should likely power off or put in plane mode what you are connected to otherwise a plane bounce could instantly wake you to a previously paused movie or song. Given the focus of these headphones you’d think they would be especially good at dampening office noises and here they didn’t disappoint, outperforming any of my other headphones. However, with plane noises, they were adequate but not as impressive. What I’d like in a plane is absolute silence, but that is problematic from a safety standpoint: if the plane is landing or has a problem the alert you don’t hear could be important to you. In an office, absolute silence could cause you to miss a directive from your boss or a question from a coworker…let alone a fire alarm or other critical alert. So, even if possible (which it isn’t right now), absolute silence is likely unsafe and unachievable until we have some kind of reliable AI listening for you to handle those alerts. That’s what I mean by “adequate.” I liked these things so much I bought three sets for each of my brothers and sister for Christmas. (Don’t tell them!). Companies need to rethink these open plan offices because they’re causing significant productivity, emotional, churn and even untimely death problems according to Lyons’ well-researched book. As IT professionals, many of the problems dealing with employee abuse, misogyny and wackadoodle ideas about how to enhance productivity and agility aren’t something we deal with. But hardware and noise abatement we can deal with. More importantly, we can buy things like headphones for ourselves and the people we care about to lower their own stress. One final comment: you don’t need to buy new headphones to address the problem. Consider just wearing your existing headphones to work. And if you’re a manager, understand that your headphone-wearing employees may not be slacking off, they may be effectively dealing with their own stress effectively and consider recognizing them for doing what is right for their own mental health. And, if you do read “Lab Rats,” you’ll likely feel motivated to buy headphones for many of the folks you care about and you’ll also likely avoid working at Silicon Valley startups like the plague.